Two girls in the US state of Florida have been arrested in connection with the death of another girl who authorities say took her own life after months of relentless online bullying. The two girls, ages 12 and 14, have been charged with felony aggravated stalking, and are said to have bullied Rebecca Sedwick online for a year. Authorities said she was "terrorised" online by up to 15 former friends. Rebecca jumped to her death from a tower on 9 September. Polk County Sheriff Grady Judd said the bullying campaign had begun last year after the 14-year-old girl objected to Rebecca dating a boy whom she had been seeing. The girls bullied Rebecca through online message boards and mobile text messages, authorities told the news media. Mr Grady told reporters authorities had arrested the 14-year-old on Monday for fear she would bully other girls. "We decided that we can't leave her out there," he said. "Who else is she going to torment, who else is she going to harass?" The 14-year-old girl's mother told the Associated Press news agency: "My daughter's a good girl and I'm 100% sure that whatever they're saying about my daughter is not true." Authorities seized some of the girls' computers and mobile phones during the course of the investigation. Reportedly found on Rebecca's computer after her death were search inquiries including "what is overweight for a 13-year-old girl" and "how many over-the-counter drugs do you take to die". Rebecca later jumped from a tower at an abandoned concrete plant. 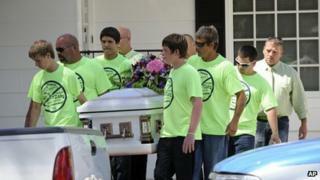 At her funeral on 16 September, pallbearers wore shirts printed with anti-bullying messages. The two female suspects have been charged under Florida's cyber stalking civil statute, which allows public schools to discipline students for harassment.